Don Doane has been bowling at Ravenna Bowl as part of the same bowling team for almost 45 years and on October 16, for the first time ever, he rolled a perfect game. 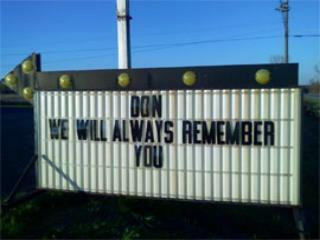 When his teammates came to surround and congratulate him, Doane, 62, clutched his chest and then collapsed. He was taken to the hospital and pronounced dead of a heart attack. What a jones. How Much Do You Want to Be on TV? I deride Americans for being willing to do pretty much anything to be on TV, but it is in Japan where that attitude really gets taken to the extreme. Take for example this crew of folks who agree to play soccer while wearing binoculars and what looks like multi-colored prisoner outfits from a cartoon. Makes sense to me. Here’s a smart way to beat Martin Brodeur during a shootout, blind him with ice and then slip the puck past him. Genius! Clive Seymour, a 74 year old grandfather of 6, was aiming for the 10th hole at Hele Park Golf Club, in Devon, England, when he scored a hole in one. The only problem? His ball went into the 4th hole. “It’s a great feeling, even if it was in the wrong hole.” Seymour said. It’s true, the league last year instituted a rule colloquially known as the “Redskins Rule” wherein the cheerleaders are not supposed to warm up in front of the visiting team’s locker room entrance. Since there are multiple entrances and such somehow the Redskins’ ladies are able to get around this rule. Meanwhile, for Roethlisberger their T&A is simply too much for he and his teammates to handle. Most players thought this ruling was an overreaction and unnecessary but clearly Roethlisberger disagrees. Hey guys, why not just play the game and THEN worry about banging the cheerleaders? You make millions of dollars, I’m sure you can charm them. So stop whining, take a peek and then go about your job. 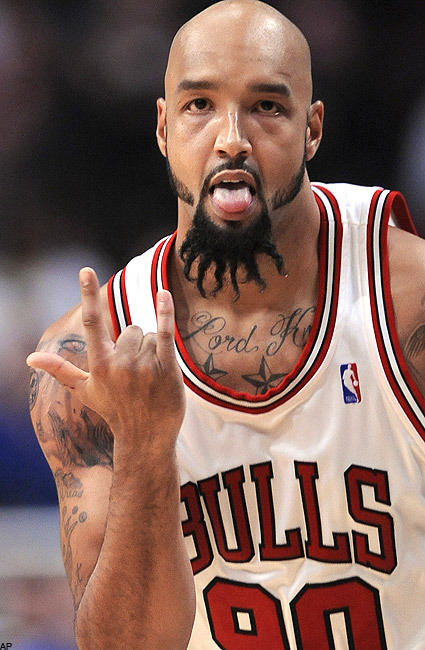 Drew Gooden WTF is that on your face? "Oh yes, spray your ropey liquid all over me!" Jeff Kent showed Monday that his redneck mustache isn’t just a look, but a lifestyle when he donated $15,000 to fight the gay marriage proposition on the ballot in California. Kent, who makes his permanent home in Texas apparently feels VERY strongly that the gays shouldn’t be messing with his America. I’m especially intrigued because Kent played his college baseball at UC-Berkeley, probably the most liberal, open-minded school in the country and yet here he is, donating 15K to a cause for bigots. Also interesting is that this is the only issue or campaign that Kent has donated money towards AT ALL. So he must REALLY be concerned about them there gays. I wonder if Billy Bean made a pass at him once or something and the fear has stuck with Kent forever.